This application explains a number of topics related to non-linear derivative contracts, such as put and call options. You can select a topic, read the summary and then use the graph view to play with various aspects of the option or option combination provided as an example. 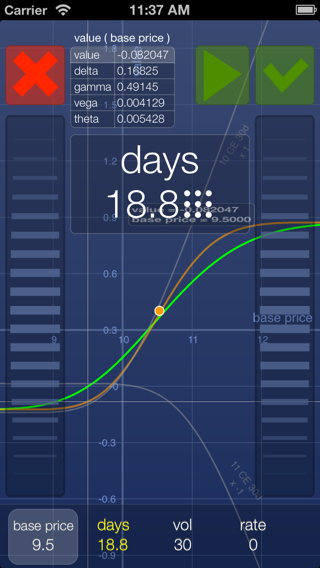 E.g., if you tap on "Show graph" button, you will be presented with a graph of how a bull call spread price changes with the price of the base instrument. On the graph view you can click on the question mark in order to get additional help on using the controls, and if you have questions about how graphs are composed you can read the help on using graphs.